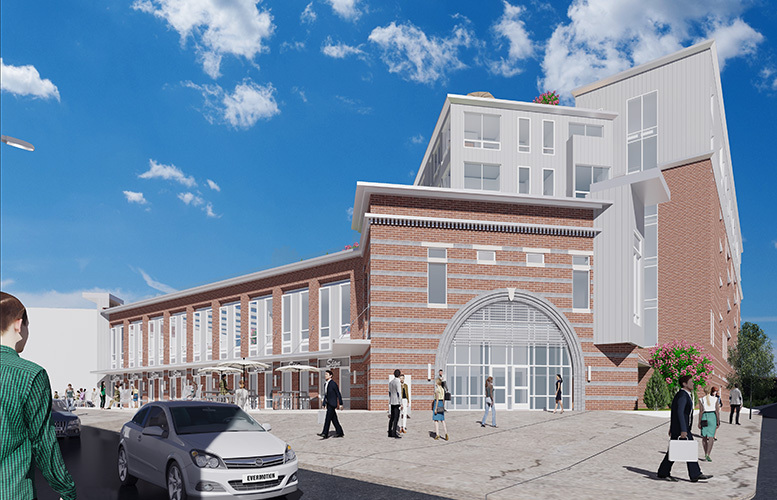 Prominent developer Charles Florio, forced to re-design his luxury mixed-use complex at the site of the Paterson Armory following the parapet wall collapse, unveiled a new design on Monday evening. Florio’s changed design preserves the semblance of the Paterson Armory by re-creating the iconic archway. He said bricks from the soon-to-be demolished Paterson Armory will be used to construct the new seven-story structure. The new building will have 138 apartments, on-site parking, amenities like a pool, and a first-floor restaurant, according to information submitted to the Board of Adjustment. Florio said the project will cost $14-15 million and two years to finish. His team presented the project to the Board of Adjustment on Monday night. “We had intended to keep the whole façade,” said architect Mark Zgoda. Florio had intended to keep the administration portion or what remains of the Paterson Armory, but a parapet wall collapse last month compromised the entire structure. Municipal officials are in process of accepting bids to hire a contractor to demolish the crumbling building on Market Street and Rosa Parks Boulevard. A massive fire in late 2015 destroyed much of the 19th century building. Florio said he still wants to preserve whatever he can of the Paterson Armory. Members of the Board of Adjustment did not have issues with the new design. However, the board’s planner, Gary Paparozzi, clashed with Florio’s team over parking spaces. The project has 151 parking spaces on the first floor. Florio’s traffic engineer Charles Olivo said that’s adequate for the project. “We expect lower vehicle ownership rate,” said Olivo citing proximity to public transportation. He said the new building will not produce significant traffic impact in the area. Paparozzi argued the project requires 256 parking spaces. Florio’s attorney Michael Ruben said the redevelopment ordinance for the area eases parking requirements. “You can’t re-write the redevelopment ordinance,” Ruben told Paparozzi. Ruben said the project does not require a parking variance. “You are wrong, sir,” responded Paparozzi. The hearing prematurely came to a halt after almost 1 hour and 30 minutes. Paparozzi had to leave the meeting after getting news that his mother had passed away, said officials. The board will continue the hearing on Mar. 21, 2019. Councilman Luis Velez, who represents the area where the armory site is located, planned to express support for the project. Velez said he likes the new design.